PT Surveyor Indonesia (Persero) - PTSI is a reputable state-owned independent assurance services company in Indonesia. PTSI has core business focus on Surveying, Verification, Inspection, Certification and Consultancy. PTSI has its business activities focused in 2 business process: Business Process related to Operations and Business Process related to Corporate Policy Establishment. PT Surveyor Indonesia (Persero) is a state-owned company and is majority owned by the Government of Indonesia. At present, PTSI is 85.12% owned by the Government of Indonesia, 10.40% by Societe Generale de Surveillance SA, and 4.48% remaining shares by PT SUCOFINDO (Persero). 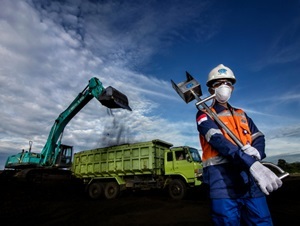 Based in Jakarta, PTSI conducted business operations in all parts of Indonesia under the management of 11 domestic branch offices, 1 Singapore overseas branch offices, 3 UWK offices, 3 representative offices and directly employs 1,581 employees. PT Surveyor Indonesia (Persero) also supported by 2 key subsidiary companies, namely PT Surveyor Carbon Consulting International (99.00%) and PT Synerga Tata International (60.00%). Degree in multi discipline for Civil / Structural / Piping / Mechanical / E&I. Fully trained and have a minimum 10 years of experience in inspection and have specialization in mechanical completion, start up and commissioning for required discipline relating with offshore and onshore facilities for oil and gas or petrochemical industries. Have good understanding of applicable codes and standards such as ACI, ASTM, IEC, NEMA, ICS 2, API, ISA, API MMPMS, ASME PTC, NEMA MG, NFPA, ISO 9000, ASME API, ASTM, AWS D11 and other standards which applicable in oil and gas industry. Degree in Mechanical / Structural / Metallurgy Engineering or equivalent or Diploma in Engineering or Technical Vocational High School (SMK). Fully trained and have a minimum 10 years of experience in welding inspector especially in Ultrasonic Testing work of structural fabrication, piping fabrication and installation and other fabrication work association with an of offshore and onshore facilities for oil and gas. Have good understanding of applicable codes and standards such as ASME B31.3, ASME B31.8, BS, API STD 650, IACS and classification rules and other codes and standards related to structural and pipe. Possess brevet certification in CSWIP 3.1/3.2 or AWS / CWI or ASNT Level II (UT) or other equivalent qualification recognize by client. Fully trained and have a minimum 10 years of experience in Coating field of offshore and onshore facilities for oil and gas. Possess brevet certification in NACE Coating inspector (Level III or II) or other equivalent qualification recognize by client. Degree in Civil Engineer or equivalent or Diploma in Engineering or Technical Vocational High School (SMK). Fully trained and have a minimum 10 years of experience in Civil construction project. Degree Electrical/Instrumental Engineering or equivalent or Diploma in Engineering or Technical Vocational High School (SMK). Fully trained and a minimum 10 years of experience in inspection of electrical and instrumentation material and equipment test such as switch gear, motor control and other equipment used in offshore and onshore facilities for Oil and Gas. Have good understanding of applicable codes and standards such as IEC 60947-4-1, EIC 61850, IEEE 1613, NEMA ICS 2, API STD 1164, ISA 95.00.01, ISA 75.17, API RP 551, API RP 551, API STD 520 PT I, , API STD 521, API STD 598, API SPEC 6A, API STD 609, API STD 607, API MMPMS 14, ASME PTC 19.3, NEMA MG 1, NFPA 70, NFPA 72, NFPA 750, ISA 12.13.10, BSI BS EN 50082-2, ASME B1.20.1,and other codes and standards rules related to Electrical equipment and instrumentation. Degree in Mechanical / Structural / Metallurgy or Engineering equivalent or Diploma in Engineering or Technical Vocational High School (SMK). Fully trained and a minimum 10 years of experience in assembling or manufacturing inspection of rotating and other such as pump, compressors, gas turbine, packaged units, and other equipment used in offshore and onshore facilities for Oil and Gas. Have good understanding of applicable codes and standards such as API RP 500, API STD 616, API STD 617, API STD 670, API STD 671, ASME B16.5, ASME B16.1, AMT B15.1, ASME B31.3, ASME Section VIII Div. I and and other codes and standards rules related to inspection of rotating equipment and unit packaged. Degree in Mechanical / Structural/Metallurgy or Engineering equivalent or Diploma in Engineering or Technical Vocational High School (SMK). Knowledgeable in rules and standards operation such as ASME B16.5, ASME B16.20, ASME B16.47, ASME 2235, ASME Section I, ASME Section IIA,ASME Section VIII Di. I and II, ASME Section V, NACE requirement and other codes and standards rules related to fabrication of pressure vessel. Qualified engineering university graduates, minimum qualification a bachelor of science or Engineering Degree majoring in Electrical Instrumentation or Telecommunication Background. Have a minimum 10 years of experience in cabling and fiber optic telecommunication system, facility security system, ship to shore link system, offshore safety communications and radar, radiation hazard assessment and control for telecommunication system. JobsCDC.com now available on android device. Download now on Google Play here. Please be aware of recruitment fraud. The entire stage of this selection process is free of charge. PT Surveyor Indonesia (Persero) - SMK, D3, S1 Assistant, Checker, Inspector PTSI November 2018 will never ask for fees or upfront payments for any purposes during the recruitment process such as transportation and accommodation.